Copyright © Photo Copyright © 2009, Jesse Fisher. Reproduction prohibited without permission. Copyright © Photo Copyright © 2009, Jesse Fisher. Reproduction prohibited without permission. - This image is copyrighted. Unauthorized reproduction prohibited. 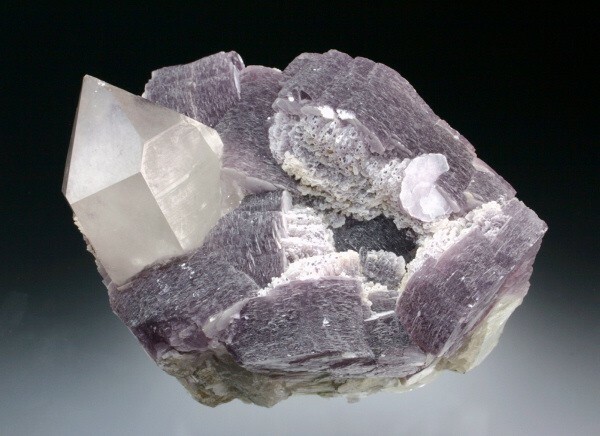 A large cluster of lepidolite crystals with quartz from the Himalaya Mine, Mesa Grande, San Diego County, California. Specimen is 10 cm across.